I remember the first time I missed out on a family outing because of digestive problems. I was eleven. And I was so embarrassed. Two years later I was in a doctor’s office in Oklahoma City because of stomach pains and indigestion. The cause was not pinpointed. Three years after that, the culprit seemed to be greasy food. Almost every time I smelled it or ate it, another episode was triggered. Maybe it was my gallbladder. At age 18, after losing 15 pounds my first semester in college, I eliminated dairy. My stomach episodes were halved with this elimination. I went to the doctor to get tested for lactose-intolerance. The test came back negative. I kept dairy out of my diet anyway. Throughout college and grad school, the stomach episodes continued off and on. Sometimes I could eat whatever I wanted. Sometimes I could only have vegetables and water. Sometimes I could have white flour. Most times I couldn’t. My test for celiac disease came back negative. My doctor told me I had irritable bowel syndrome. I often cried myself to sleep because of the stomach pain. Sometimes the pain was so intense, I couldn’t breathe. Sometimes the pain was worse than that. This past September, one month into my fifth year of teaching, almost all food suddenly gave me heartburn and made me quite sick. Even a glass of water necessitated a prompt Zantac75. Every time I ate, it felt like I’d been punched in the abdomen. The only foods that were safe were strawberries, blueberries, fish, almonds, and avocados. So that’s what I ate. After about a month, I added sweet potatoes and kale. I had no idea what was going on. There seemed to be no rhyme or reason to what my stomach could handle. I lost 25 pounds. When something goes wrong, it is natural to look for the reason. If there is a strange smell in the refrigerator, we go looking for the culprit and throw it out. Sometimes pointing the blame helps relieve pent up feelings. When this last bout with my system started, I tried find the source of my problem. I went to my doctor. Numerous tests and one endoscopy came back with nothing. No food intolerances. No allergies. No inflammation in my stomach. No ulcers. No autoimmune disease. According to my lab work, I was fine. I was angry and frustrated. I pointed the blame-finding questions towards myself. Is there something I could have done differently? Is this my fault? Why can’t I handle stress better? What am I supposed to learn? Why can’t I fix this? What am I doing wrong? I had lost some control of my body. I felt that if I could find the source, then I could fix it. There were a lot of ‘I’s in my plan for healing. Through the muddled worrying and thinking about what to do next, I felt a gentle prompting to let go of the ‘I’. Who is the Creator and Lord of every cell in your body? Who is your Health and Salvation? Can you walk through this without grasping for answers? 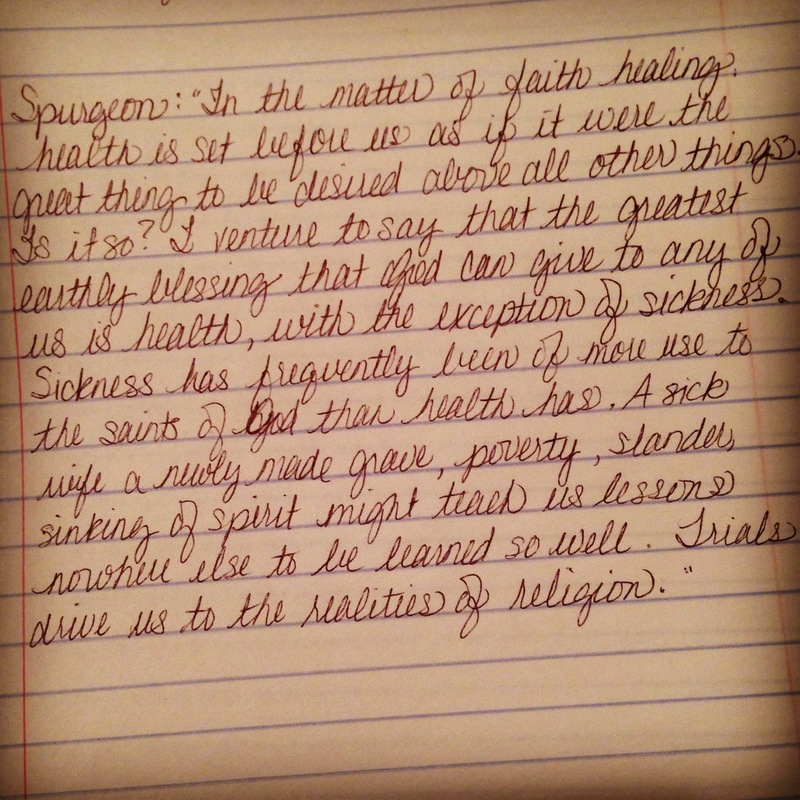 Can you be content with my plan for sickness and healing that you cannot control? Going to the doctor, reading articles, and undergoing tests were not wrong, but putting myself in control of my hurting and healing was prideful. Instead, how much better would it be to see my doctor and undergo tests while laying the burning, fault-finding questions at the feet of my Savior? How much better to seek answers with a gentle and quiet spirit instead of a feverish worry? Fear is a quiet, subtle enemy that always seems just within arm’s reach, waiting for a chance to slip back in my heart. It’s had plenty of opportunities – through being unable to drink water for a week, through feeling weak and tired, through feeling constantly hungry, through discouraging results, through the sudden death of a childhood friend from unknown digestive problems. And He remains to remind me every time fear starts to creep in. The unknown inside my body is not unknown to Him. I must admit, I really thought this new phase would last a couple months at the most. I get aggravated and complain. I’m impatient to stop bringing my own food to restaurants, bored with sweet potatoes and kale, and tired of fighting resentment. What is the point? But who remembers my sorrows better than the Man of Sorrows who has numbered even the hairs on my head? Can I persevere in His Name and through His Strength? More than watch men for the morning. At a purely physical level, yes, this about a digestive system gone awry and I want healing. I would like to be able to eat more foods again, or at least know why I can’t. But at the same time, this is not about my stomach as much as it is about the God who created it, and the love, hope, peace, and joy that He gives. And through it all He is patient to re-teach my heart these truths when the pain in my stomach makes me forget. He is all in all, and my relationship with Him is paramount to the health of my body.